I happened across this sculpture in the Orto de’Pecci in Siena. The Orto is a lush open field with a decent pizza restaurant, numerous orchards, stables for some twenty horses, and a motley zoo of peacocks, ducks, and—antelopes. 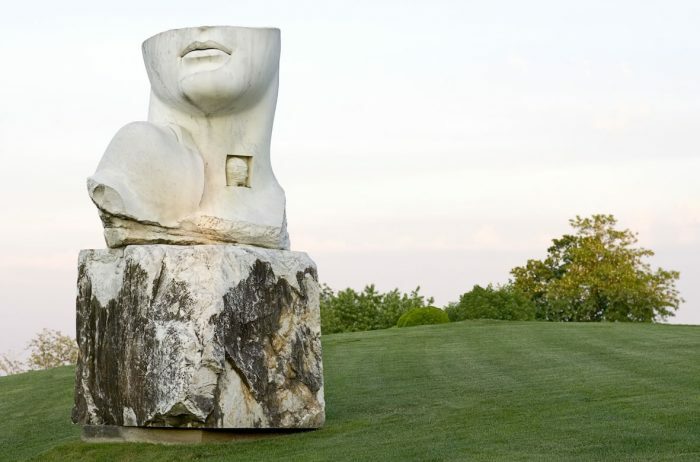 There, off to the side of the open field of grass, is this colossal steel head, staring blankly across the scene. The sculpture is entitled “Open Mind” by Justin Peyser, who is, incidentally, a Harvard grad in Visual and Environmental Studies currently working in Bologna. Peyser welded together the head crudely, yet somehow delicately. The rivets and welding trails take on the character of the pterion and lambda lines where the bones of the skull fuse together. Peyser welded the crown into an elegant spiral, suggesting, I think, a certain inscrutability. It is the size of a room; one can easily walk inside of it. In its colossal-ness, it evokes the Head of Constantine in Rome, as well as the severed head of the Iron Giant, or even the Machine Man from Lang’s Metropolis (1927). It is certainly an homage to Shelley’s “Ozymandias.” And it is very much part of a tradition I’ve noticed in Italian sculpture to construct huge limbs of giants (or whatever) and leave them lying about various public venues, like this work at Ca’ del Bosco near Brescia, or the Lorenzo Quinn’s enormous hands at Ca’ Segredo during the 2017 Venice Biennale or Igor Mitoraj’s well-ruined sculptures complementing Pompeii. * Open Mind, then, can safely be categorized as another among the genre of monumental Italian sculpture grappling with the legacy of Rome, that hulking mute carcass of history that perpetually haunts the peninsula. One can step inside the skull of Open Mind. Peyser has cut free the pupils, so that visitors can literally see through the eyes of the giant. It is empty inside, except for tiny version of the head stashed away in the chin area. The proposition (along with the spiral formation), of having a head-within-a-head, evokes the old adage of “turtles all the way down.” What’s inside the little head? Why a littler head of course! Keep asking “why” and you’ll find yourself deeper in a nesting doll with no better answers than when you started. Needless to say, I liked it a lot. *I am pretty sure the Ca’ del Bosco sculpture is also by Mitoraj.